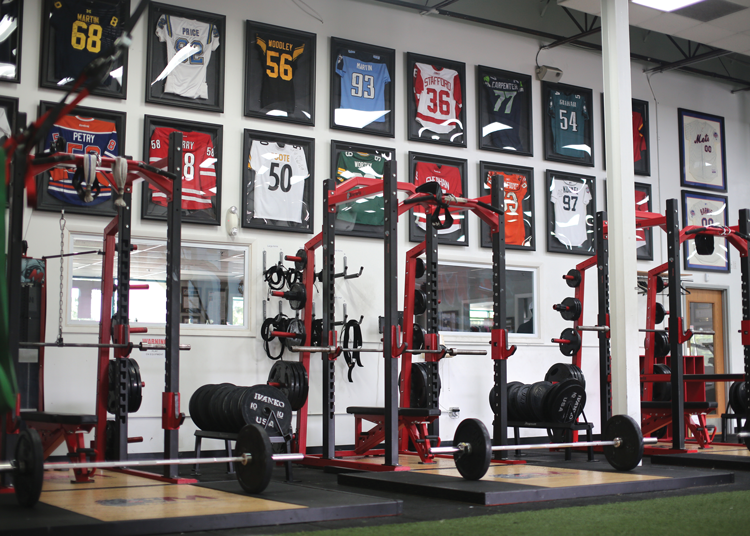 The facilities at Barwis Methods Training Center in Plymouth. When Mike Barwis arrived at the University of Michigan in 2007 as the football team’s director of strength and conditioning, he met Brock Mealer, who had been paralyzed following a car accident. “I worked with Brock for two years, and picked him up every day and brought him to practice,” Barwis says. “Then one day his mom calls and says his insurance was about to run out. So I pulled him aside and asked him if he really wanted to walk again. When Barwis left U-M in 2011, he started Barwis Methods Training Center in Plymouth. Today, there are 37 centers around the world, including locations in Canton Township and Grand Rapids. Barwis Methods’ holistic and personalized approach utilizes a combination of modern sports science, manual manipulations, biomechanics, psychology, spiritual truth, and individualized, physiologically-designed adapted training cycles. He also developed the Barwis Methods Injury Recovery program, which uses neurological re-engineering to relocate, activate, and control muscle fibers. So far, the program has helped 90 people regain mobility, Barwis says. He also works with pro and collegiate athletes, as well as people young and old who have suffered various types of injuries.